The universe is a forest, patrolled by numberless and nameless predators. In this forest, others are hell, a dire existential threat. Stealth is survival. Any civilisation that reveals its location is prey. Earth has. And the others are on the way. The Trisolarian fleet has left their homeworld and will arrive... in four centuries' time. But the sophons, their extra-dimensional emissaries, are already here and have infiltrated human society and and derailed scientific progress. Only the individual human mind remains immune to the sophons. This is the motivation for the Wallfacer Project, a last-ditch defence that grants four individuals almost absolute power to design secret strategies, hidden through deceit and misdirection from Earth and Trisolaris alike. Three of the Wallfacers are influential statesmen and scientists, but the fourth is a total unknown. Luo Ji, an unambitious Chinese astronomer, is baffled by his new status. All he knows is that he's the one Wallfacer that Trisolaris wants dead. If The X-Files taught me one thing, it was to be afraid—to be very afraid—of escalators. I learned early to take the stairs, or else be consumed by Eugene Tooms. But the recently revived TV series taught me at least two things, in truth: that, and the fact that thinking of Earth as the cradle of all creation in the unimaginable vastness of the galaxy is an act of absolute arrogance. I want to believe, in other words. Absent any evidence, however, belief is a difficult state to sustain. It necessitates a leap of faith I've never been able to take—though that's no longer a problem for the characters at the heart of the startling second volume of Cixin Liu's translated trilogy, as they, and humanity as a whole, have had that proof. In The Three-Body Problem, our wildest dreams were realised in the same second as our worst fears: they are out there, and now that they know we're here, they're coming... coming to wipe out every last trace of humanity from the galaxy. The thing is, they're going to take four hundred years to get here. But when they do? We're toast, folks. In this way, a great wave of defeatism sweeps the people, not least because they know that nothing they do now will have the slightest impact on the Trisolarans. The present-day generation's only potential legacy is laying out the groundwork for humanity to develop in centuries ahead. Today, the knowledge base just isn't there, nor indeed will it ever equal the quantum technology bolstering the Trisolarans' far superior force. That's because of the sophons: a mass of microscopic particles which interfere in certain experiments, establishing an energy-based barrier beyond which scientists simply cannot cross. We haven't hit it yet, but we will, one day. And then? Well, it'll be The End, my friends. And that's not all the sophons are good for—or bad for, depending upon your perspective. They can't quite read minds, but everything else is an open book to them, and in turn to the extraterrestrials who seeded these beings here. "The sophons can understand human language, and they can read printed texts and information on every kind of computer storage media at ultra-high speeds." (p.100) So we can't count on keeping any secrets, either. To make matters worse, even in the face of imminent extinction, "the unity of the human race is still a distant dream." (p.46) In our frustration and our desperation, we turn on one another. Precious time is wasted. Wars are fought. Lives are spent like so many cents. Humanity becomes lost in a dark forest, in short—until a distant light is lit. So long as we do not communicate with the outside world, every individual keeps things secret forever from the sophons. This is the basis of the Wallfacer Project. The first three Wallfacers—Frederick Tyler, Rey Diaz and Bill Hines—represent "balance and compromise among the political powers of the United States, Europe, and the Third World, so there was considerable interest in the final selection. (p.105) Readers, let me introduce you to Luo Ji: a nobody till now, a nothing whose first thought is "screw the Wallfacer Project," (p.133) Luo Ji is the closest thing The Dark Forest has to a central character, and though you mightn't like him, you needn't, really. As the last, best hope for humanity's survival, he's a markedly more active and interesting main man than Wang Miao was in The Three-Body Problem. Additionally, Luo Ji is a figure mired in mystery, in that he doesn't have a clue what he has to offer the Wallfacer Project—nor indeed do we. All we have to work with is what we see: a woebegone wastrel and womaniser who once upon a time had a conversation about cosmic sociology. The significance of this subject is certain, since said conversation is related to readers—albeit by way of a passing ant—in The Dark Forest's sublimely surreal prologue, yet the ways in which Luo Ji could conceivably use cosmic sociology to save the day, or at least delay it, remain a mystery until the novel's equally alien and similarly satisfying finale. In the interim, the plot is powerfully punctuated by the systematic unravelling of the plans the other Wallfacers make at the hands of their Wallbreakers: the dedicated members of a cell of terrorists sympathetic to the extinction event ahead. The threat they represent—to Tyler, Diaz and Hines, to be sure, but also to the whole of humanity—generates a relentless tension that keeps The Dark Forest on target even when its author dives deep for the fifteenth time into the psychology of a people without secrets. 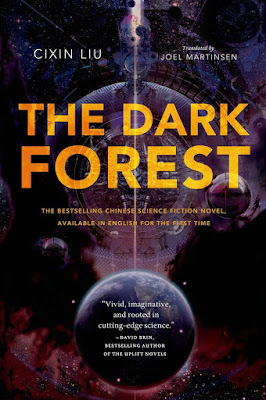 Phenomenal as it was, The Three-Body Problem got a couple of things wrong—mistakes I'm over the moon to state The Dark Forest does not make. That said, the elegance and otherness of its setting struck me as simply exceptional then, and it continues to impress in book two, which doubles down on that striking sense of wonder by taking place in two discrete periods. The first is fine, if fairly familiar, but the second—which I refuse to ruin—is as astonishing as the interstellar ark of Neal Stephenson's Seveneves and the intelligent generation ship of Kim Stanley Robinson's Aurora—evidence of the embarrassment of riches science fiction has seen recently, which The Dark Forest definitely numbers among. It has its faults, for sure: the poetry of Liu's prose sometimes verges on the verbose; a great deal of the dialogue he describes is simply insipid; the narrative's secondary characters are at best forgettable; and the first quarter of the novel is nearly impenetrable. But this is a big picture to behold: bolstered as it is by a complex protagonist, an engrossing, high-stakes story and a truly transcendent setting, The Dark Forest is by every measure a better book than The Three-Body Problem—and The Three-Body Problem was awesome. Reading now and loving it. Cixin Liu is brilliant!